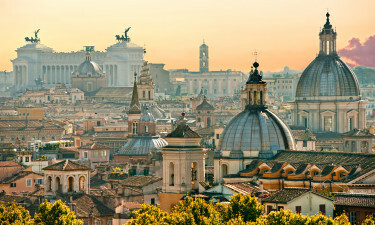 Once the heart of the Roman Empire, modern Rome mixes ancient history with a vibrant city culture. Beyond the city, discover the beautiful Italian landscape, with its hills and rivers. Lux-Camp provides everything you need for your camping holiday, so you can get out and enjoy the adventure. As the capital of the Roman Empire, Rome was the centre of European civilisation for hundreds of years, and still has a huge cultural influence on Western life. The region of Lazio has its own rich history and geography to explore. Why go camping around Rome? A short drive from Ciampino Airport, luxury Camping Fabulous offers mobile homes, chalets and bungalows, for a flexible and family friendly camping holiday. Cool off in the pool after a day of sightseeing. Named for the pine trees surrounding the campsite, I Pini is a small and friendly site with a family atmosphere. A restaurant and takeaway service mean it's easy to eat onsite. The Mediterranean coast isn't far from Italy's capital, and there are some beautiful beaches to be found within easy reach of Lux-Camp's luxury camping sites. Try Anzio for clean, warm water and safe swimming, or Fregene for nightlife. Lakes, forests, and the seven hills which surround Rome are great for anything from a gentle stroll to serious hiking. 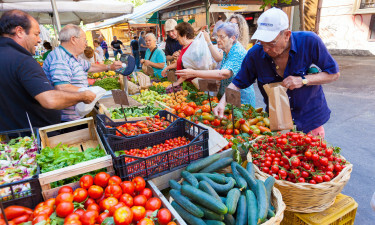 Italians are famous gastronomes, and in Rome you'll find everything from fresh, hot pizza to luxury specialties like saltimbocca. Near your holiday camping site, try the local seafood and home cooked pasta. Both red and white wine are cheap and good quality, and a meal is rounded off with a glass of limoncello, a refreshing lemon liqueur. 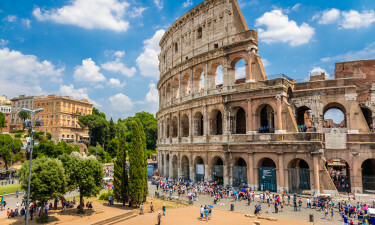 For the ultimate Roman experience, hire a scooter to whizz you past the Trevi Fountain, the Spanish Steps and the Coliseum. Families and the cautious might prefer to walk or take the metro. 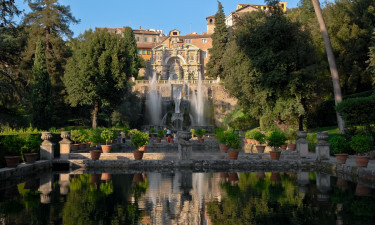 It's easy to spend the entire holiday in the city, but you'll miss out on nearby attractions like Frascati, home of the famous wine, the Etruscan necropolis at Cerveteri, and the fountains and gardens of Tivoli.